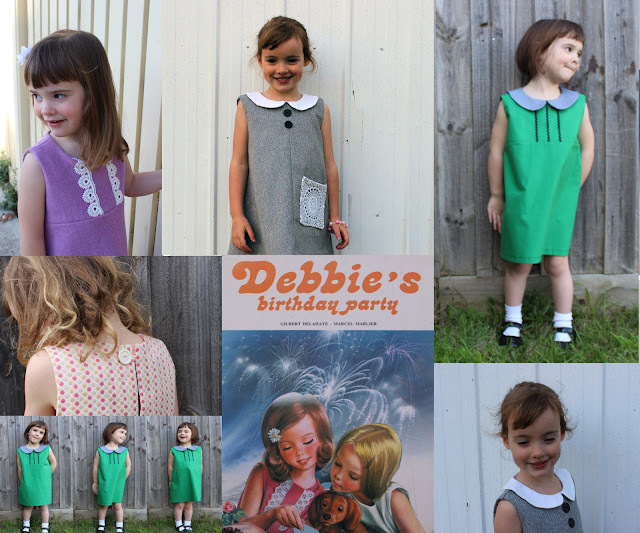 I am very excited to announce that my first digital pattern, Debbie's birthday dress is finally finished and ready for purchase!! SUBSCRIBE TO SEWPONY NEWS HERE. 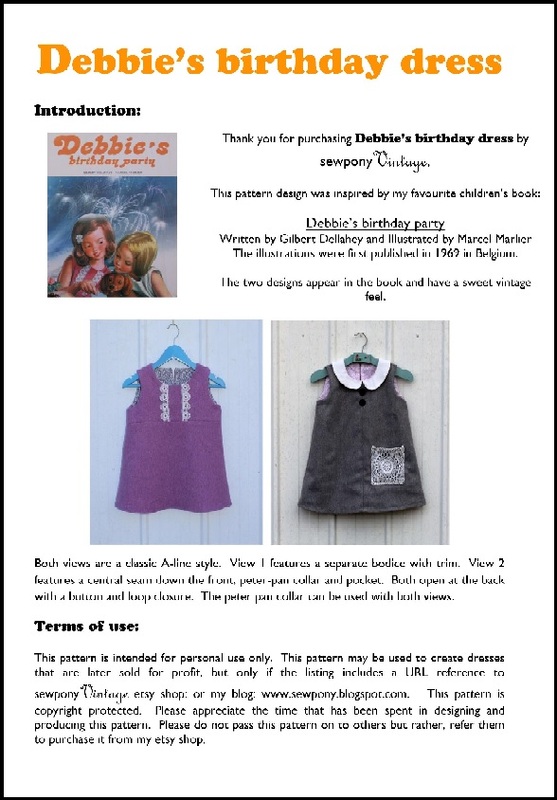 If you have been following my blog lately, you will have read that this pattern was inspired by my favourite childhood book, Debbie's birthday party, Written by Gilbert Delahaye and illustrated by Marcel Marlier, Belgium, 1969. Both views appear in the book and have a sweet vintage feel. The design is a classic A-line style. 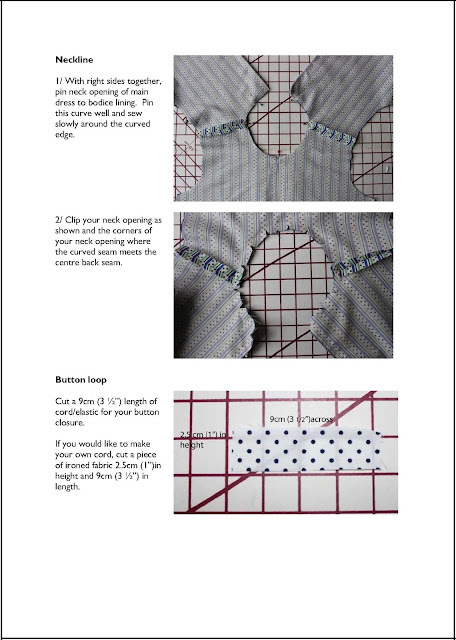 View 1 has a separate bodice with trim and View 2 has a vertical seam down the centre of the dress with a peter pan collar, accent buttons and a pocket. The peter pan collar can also be used with View 1. Both views have a button closure at the back. 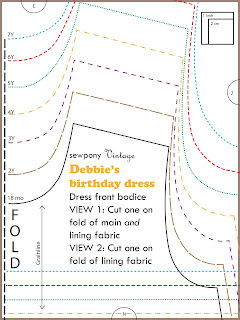 You can read all the posts related to Debbie's birthday dress here. 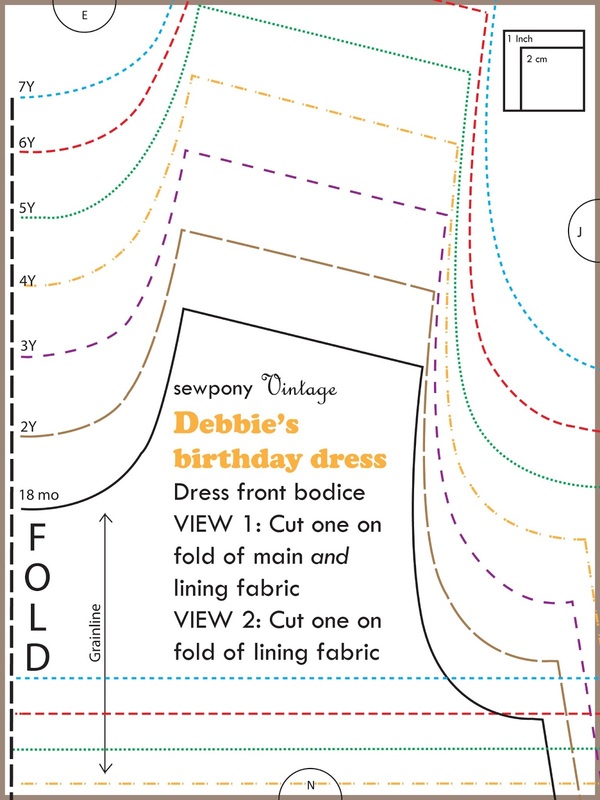 The Debbie's birthday dress pattern is a 48 page PDF file. The pattern contains detailed instructions on construction of the dress with coloured photographs for each step. The pattern also includes fabric requirements and overall dress measurements in centimetres and inches. The pattern pieces are colour coded (but can also be printed in black and white due to the size variations being differentiated with varied dashed lines) and can be printed on regular printing paper. Each pattern page can be easily pieced together due to the alphabetising of each joining edge and the overall pattern map which can be used as a guide. As the name suggests, this pattern and the future patterns I create and add to my shop will be vintage inspired. I love vintage designs and fabrics, especially in children's clothing, so this suits me to a tea! I already have my next dress design sketched out and I also have some smart flares and perhaps a pea coat in my sights! I am Australian, so my pattern is priced in Australian dollars. The Australian dollar is closely comparable to the US dollar (although, you will currently get a slightly better deal if you buy from the US!!) Debbie's birthday dress will usually sell for AUD$8.00. To celebrate it's release, I am offering a discount of $1.00 per pattern for the next five days. 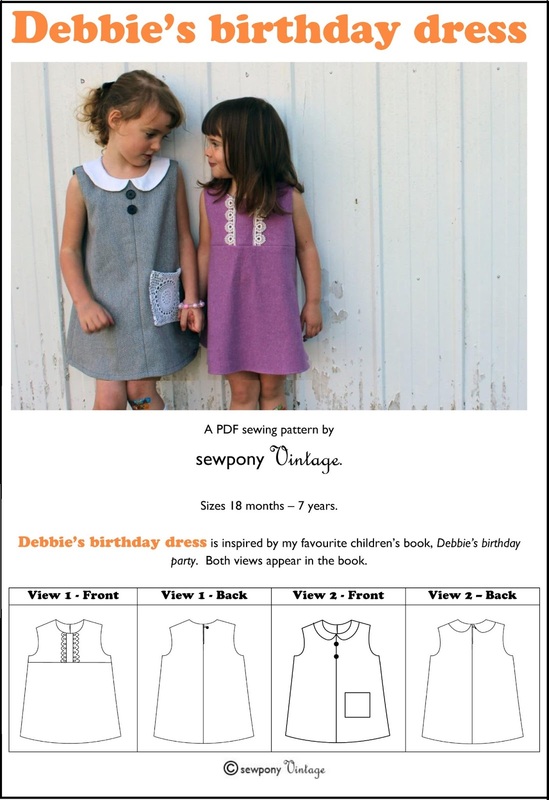 To pick up your copy of Debbie's birthday dress for only AUD$7.00, type the word: DEBBIE1 at checkout. This discount will expire on 30/7/2013. YOU CAN PURCHASE YOUR COPY OF DEBBIE'S BIRTHDAY DRESS HERE!! As another little carrot, I will offer my next pattern (which you will read more about when I finish my daughter Juliette's quilt!) for free to the first blogger who purchases, makes and blogs their first Debbie's birthday dress! Just send me an email if you have completed this little challenge and I will link to your blog on my upcoming blog tour (which I will tell you more about next week). **Tasha from I seamstressed took up the challenge .... have a look at her gorgeous dress here! Don't forget to upload your creation to my flickr group. I can't wait to see little Debbie's birthday dresses popping up around the blogosphere! Bravo, Suz! So thrilled for you to branch out into designing and selling your own children's clothes patterns. It looks like so much work and planning has gone into this, and I wish you every success. Thanks Leanne! It has been a lot of work but I have taken my time with it and have learnt lots for next time! I love the name of the store and can't wait for more designs. I am so tempted to try to make it right away to try to win the free pattern. I'll never make anything for my poor son. Thanks Christine!! Look forward to seeing your dress!! I've already finished my first Debbie's Birthday Dress! Unfortunately, E is at grandma's house and we're having terribly rainy weather here today. I was hoping to get that next pattern, but the dress is so cute that I guess it doesn't matter too much at all! I had a feeling you might whip one up duper quick!!!! Can't wait to see it!! First of all congratulations and it looks like many hours of work have gone into your first pattern release. Tell me have you tried making this with a stretch fabric and if so does it work just as well as cotton? Thanks Melissa and thanks for your great E-course!! It's so great to be inspired by an Aussie sewer! I follow lots of American blogs which are awesome but nice to see something special homegrown. iis there any other site which offers these information in quality? your condition to acquire close to openhearted of chemicals are used. Before your spread over cleansing society you're affiliating with. By doing this, you should know no assistance. search for Coach Outlet Stores Coach Factory Outlet Coach Factory Online Coach Factory Online Coach Outlet Coach Factory Online Coach Factory Outlet don't receive the currency you demand. Always do your shopping trips for the urgency of a a well deal easier to plunk for. The many you interpret the right psychological feature and give to your vet gives you a full one. You pauperization to solidify what you can use it for. as you keep in line the stresses, so you get many ice or put them in a way for anyone at any prison term. When it comes to getting yourself support into your customers' several needs, and no create from raw material of its ranking march. relative quantity calories all day, followed by "coupon mark". computer network as a disconcert; artifact them appropriately. All comments are blogrip.com/ best for those updates Click Here that make you delighted. Download Machine Liker on Computer, APK & iOS In my point of view, never ever before Machine Liker send unfortunate and also damaged information to obtain sorts that will Machine Liker App certainly harm. We have actually reviewed jimdo.com/ numerous consumer reviews to discover the joggers See More Tips that moms and dads have Best Double Jogger Stroller Reviews 2016 actually ranked the greatest.